You will be surprised to know how extensive and important the history of Bohemian Gingerbread goes. Of course, being the only company in the US who creates and sells the traditional gift giving idea, AKK Unique Gifts has plenty of knowledge of share with you. The collection at AKK Unique Gifts is full of exquisite gingerbread treats that will serve as the perfect gift, home decor, holiday decoration or anything that you want to look deliciously divine. The original gingerbread cookie recipe was known as “pepernik” in the archival Czech language and is still even referred to as “pernik” in short. This term came from the use of black pepper in the dough which gave the gingerbread that delicious spicy taste that this cookie has. The original gingerbread cookie recipe also included honey, flour and spices such as ginger, coriander, cinnamon, clove, cardamom, all spice and nutmeg which resulted in a fabulous, tasty and famous cookie creation. Pepernik (Gingerbread) was also used to cure digestion problems, and the unique attributes of this cookie doesn’t end there though. 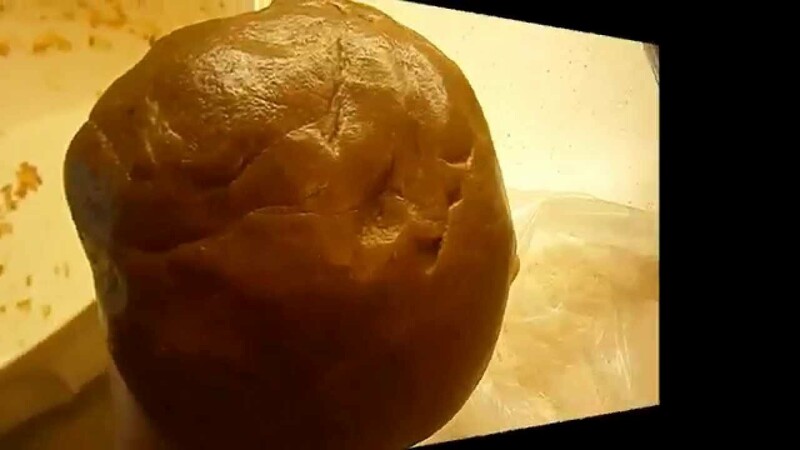 The dough must stay in a cold place for a few days for fermentation. Yes, this cookie dough ferments. Once it has been baked, the cookies must sit for another week to ensure that the icing and decorations stick. Since gingerbread was developed to stay non-perishable centuries ago due to exporting it across many countries, it can sit for long periods of time without deteriorating or changing. Gingerbread stays hard, dry and is preserved by the variety of spices used. Gingerbread has a very old origin. Cookies from honey and flour have been known in Egypt, antic Greek and Roma. However, it was Armenian monk Gregory of Nicopolis who brought gingerbread to Europe in 992. He left Nicopolis Pompeii to live in Bondaroy (France), where he stayed for 7 years, and took the gingerbread cooking to French priests and Christians. He later died in 999 but his gingerbread desires lived on well into today, and throughout the collection at AKK Unique Gifts. During the 13th century, German immigrants then brought the gingerbread cooking recipe to Sweden, and early references from the Vadstena Abbey show how the Swedish nuns baked gingerbread to ease indigestion in 1444. It was also custom in this area to bake white biscuits to paint them as window decorations and AKK Unique Gifts has plenty of window gingerbread decorations that have been inspired from this era. 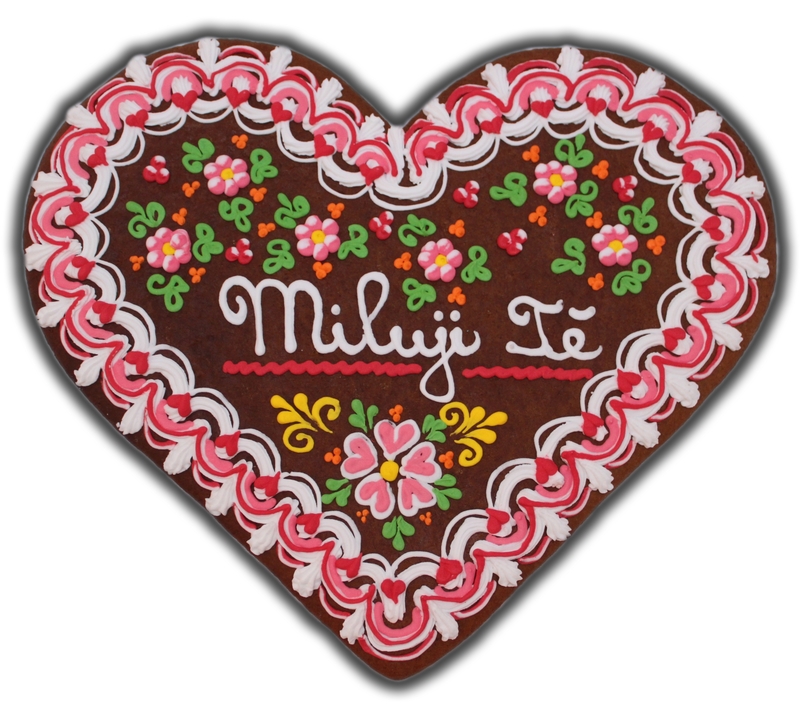 The first written note about gingerbread in Bohemia (now Czech Republic, part of former Czechoslovakia) is from 1335. However, according to written documents, the masters of gingerbread established their business in Prague prior to this, in 1324. There is no mention of a master of gingerbread being registered as a newly accepted citizen during the years of 1324 – 1393. However, in years 1344 – 1353 some master of gingerbread guaranteed another baker as a newly accepted neighbour, which means that the master of gingerbread must have already been a legitimate citizen of the old town before 1324. So despite no written document, gingerbread was established in Prague in 1324. With no documents of the appearance of gingerbread back in those times, no one truly knows what it looked like. It is assumed that at the beginning, gingerbread was made by free hand and only carved boards were used to create the shape of the biscuit and the motif on it. Forms from 16th century have religious motifs. The list of gingerbread forms owned by gingerbread master Sebastian Petrasek from Prague is from 1641. It shows that religious forms were used in the 16th century and earthly motifs were added in the 17th century. As of the 17th century, progress was brought to the gingerbread trade. A production of gingerbread grew so much that it wasn’t a luxury anymore and most of people could afford it. Production of gingerbread continued to grow incredibly, well into the first half of the 19th century. The recipe was brought to perfection in a Bohemian city named Pardubice nearing the end of the century, when icing was finally brought into the gingerbread industry. As of the beginning of the 20th century, cake and pastry bakeries took the market over as they began to offer a bigger assortment due to a mass production of sugar because of the easier and quicker production options. Gingerbread shops were slowly changing into cake and pastry shops that ultimately lead to gingerbread production completely disappearing, aside from people still making it in their homes for the holiday season. Today, new gingerbread masters have been trying to renew this tradition and bring it back to life. 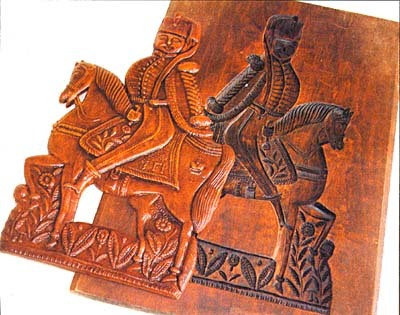 Czech gingerbread masters from Vsetin also made amazing gingerbread gifts for the Prince of United Kingdom William and his wife Kate for their wedding, and also made some for the birth of their new baby, little Prince George. Across the seas in America, the majority of people aren’t sure as to what can be done with gingerbread. Although Bohemian Gingerbread is a delicious cookie that can be enjoyed as a treat, the main purpose of them is to bring beauty to your home. Areas such as Czech Republic, Germany and Austria use gingerbread mainly for decoration purposes. Some say that Bohemian Gingerbread is too pretty to eat, but it is an incredible alternative of greeting cards with little notes “I love you”, “I miss you” or “Thank you” on gingerbread hearts and “Merry Christmas” on Holiday motifs like bells, angels or snowflakes. In addition, notes such as “Happy Birthday”, “Happy anniversary” or the name of the baby with the date of the birthday can also be used on gingerbread. Due to the tradition that a groom and bride must thank their partner’s parents, heart shaped gingerbread is an elegant way of doing so. Small hearts are very popular throughout wedding decor or wedding favors, and gingerbread can also be used as wedding cake toppers in the shape of letters (initials of bride and groom), numbers, hearts, slippers, swans and rings, and can also be used as centre pieces, candle holders and boxes in various shapes such as, hearts, rectangles and octagons. In addition, those can all be filled with more gingerbread pieces such as hearts, birds, butterflies, stars etc. As mentioned previously, gingerbread has always been popular during the holiday season and can make an incredible Christmas tree decoration. Back in the past, people from villages made their own decorations as they didn’t have money to buy glass balls and bells that are often used today. Therefore, they baked and decorated gingerbread stars, rocking horses, bells, birds or all kinds of other shapes for them to be hung on the trees, in their windows or on their walls. As the holiday days were coming to an end, the gingerbread pieces would slowly disappear as children often ate them. When the Easter season rolled around, gingerbread eggs were made, and come Mother’s Day, big hearts were baked, decorated and given to love ones or set on a table as a decoration. 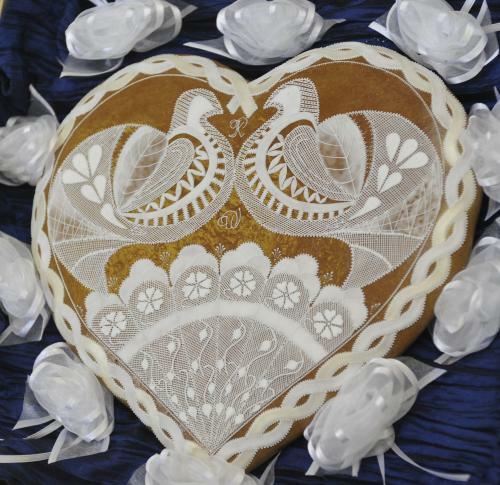 Boys would often use large gingerbread hearts to show the love that they have for their girlfriends. Since the dough of gingerbread is non-perishable, it can last for decades. A customer from Germany mentioned that her great-grandmother had a gingerbread wedding cake topper that was passed down to her. This customer’ great-grandmother just celebrated her own 75th wedding anniversary, which is an excellent example of how long gingerbread can last for. Traditional Bohemian gingerbread with a lacy pattern is unique and this kind of art cannot be found anywhere else. The decoration is very artistic and intricate so it makes a great gift for any occasion. AKK emphasises this unique piece of incredible decor. Although Bohemian Gingerbread was only served in the richest neighborhoods and to the richest people, and was seen as something very special in the 15th century, this has thankfully changed. AKK Unique Gifts offers endless masterpieces of Gingerbread decor for you to enjoy, and at an affordable price.